Ito and I ended our Italian/French/Netherland vacation (see https://wcoats.wordpress.com/2011/07/23/travels-in-italy-and-france/) in Amsterdam visiting friends (Bill Wirt, Dolph Westerbos, and René van Hell). While there, we enjoyed the usual sights and the coldest July day in the Netherlands (July 24) since 1903! Then Ito took the plane home to Washington DC while I headed on to South Sudan. While Amsterdam was having its coldest day, Washington was suffering one of its hottest days in history. The same weekend had the only two consecutive days with lows above 84 decrees ever recorded. The high temperature of 105° at 3:52 pm on July 22 at Washington Dulles was a new all-time record, beating the old record for July 22 of 98° in 1998 by 7°. By the 24th Dulles had “cooled” down to a high of 94° (97° at Reagan National). The average global high may well have been perfectly normal (I couldn’t find such data if it exists), demonstrating that distribution does matter. I left Southern Sudan on June 21 and returned on July 27th to the newly independent Republic of South Sudan (on July 9). The introduction of the new South Sudanese Pound (SSP), which our Deloitte team has been helping the local authorities prepare to issue for over a year, had started on July 18th. The replacement of SDG (Sudanese Pounds) with the new SSP is targeted to be completed by the end of this month (August—a 45 day period). The establishment of the new Central Bank of South Sudan, though inheriting most of the staff and buildings of the Bank of Southern Sudan (a branch of the Central Bank of Sudan headquartered in the North), is being seriously hampered by the failure so far of the President of the Republic to appoint its new Governor and Board. The big success on this visit was the launch of foreign exchange auctions after the new central bank law wiped out all of the exchange controls imposed by North Sudan when Southern Sudan was part of it. The Central Bank of Sudan (the central bank for the whole country before the South spit off) was running out of foreign exchange reserves (foreign currency owned by the central bank that it could sell to the market to influence the exchange rate of its currency). It wanted to keep its exchange rate to the U.S. dollar and other foreign currency low so that those holding its currency could buy dollars more cheaply (a so-called “strong” currency). But to do that it had so sell dollars from its foreign currency reserves. When it was running out of dollars, it could no longer support the exchange rate it wanted. So it imposed restrictions on the purposes for which people could buy dollars with the Sudanese Pound (restricting demand) in order to support it’s artificially low (strong) exchange rate. As a result, a spread of up to 1½ percentage points opened up between the official rate and the street (black market) rate. South Sudan has removed those restrictions and introduced twice weekly auctions of U.S. dollars to the highest bidders. There have been three auctions so far and they are working well as the market gets used to them. The spread between the official and street rate (no longer illegal) has already narrowed to about 25 basis points (a quarter of a percentage point). Today we hit a big bump in the process and the acting governor, responding to political pressure capped the exchange rate for the next auction below the rate of the last one. We expect the announcement of a permanent Governor very soon. 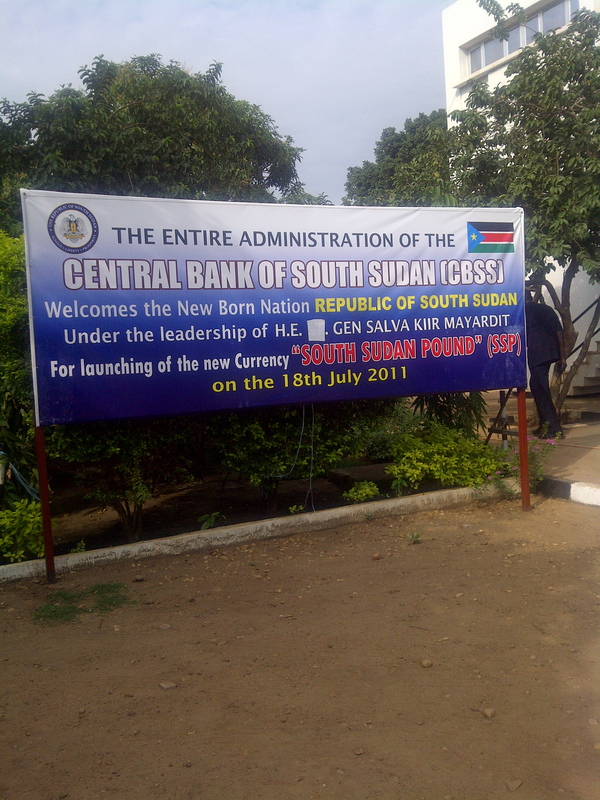 After independence, the Bank of Southern Sudan became the Central Bank of South Sudan (CBSS). The Bank has a fairly large courtyard in the middle where people gather to chat or smoke cigarettes and where the Governor holds large staff meetings. You can see it in the attached picture. I stepped out of my office on to the far edge of the courtyard the other day and was standing next to one of the Bank officials. He was on his cell phone and obviously expecting to meet someone: “Where are you? … You are standing under a tree? … What tree? We have a lot of them.” Every now and then a fairly large monkey drops out of one of them, which always gives me a start. There seems to be more life around the Bank than before. After all, there is a lot going on (introducing a new currency and starting new foreign currency auctions). Yet the halls of the Bank are still cluttered with employees that are half asleep. I am not really sure what their duties are. Work habits are not very good here. Many of the African Sudanese in the South cling to the habits of the African lion, which lies around and sleeps most of the day, while his lionesses round-up the food and do the dishes so to speak. The entrepreneur spirit is in rather low supply. Many of the businessmen and shopkeepers are Kenyans or Ugandans. The traditional pastoral and often nomadic lives of many Africans roaming the plains of Sub-Saharan African are not all bad, by any means. You can’t listen to them sing without hearing some happiness there. But it is too easy for those of us not living it day after day to overly romanticize it. Life at the Afex Riverside Residence at the edge of the Nile remains the same. I continue to be impressed with the timeliness of Deloitte’s team for the morning and after lunch departures of its six cars. In the few minutes before 8:00 am every day except Sunday, thirty or so consultants converge on the car park from several paths and at 8:00 am sharp the cars start pulling out for the drive to the various Ministries (and in my case the Central Bank) at which they work. Often the departure, especially after the lunch break, is virtually simultaneous with all six cars departing from the camp one right behind the other in a caravan. It is an impressive sight. On irregular trips, the drivers are required to provide a radio report to Base on who is with them and where they are going so that Base knows were every one is. It goes something like this: “Alpha to Base. Alpha to Base… This is Base. Leaving Charlie, Charlie, with Bravo D-4 (or whoever) and with, with, and with one “unassigned.” I am the “unassigned” because I talked Base into not having to carry a bulky two-way radio around, because I almost always travel with colleagues who have one. A few days back, while eating dinner in the Afex dinning hall—a very pleasant open air facility along the edge of the Nile—a strong gust came up that caused a heavy shower of little black things that covered the dinning room tables, floor, and my plate. I assumed that it was the carcasses of the hundreds of thousands of zapped insects that had given up their lives to the several electric bug killers overhead. I was greatly relieved when I learned that they were little mango seeds that had collected on the canvas roof and were dislodged by the brisk wind. At dinner this evening our British security officer and another Englishman where telling war stories across the table from me. I was only half listening, but the other Brit’s story about their first-rate French interpreter (they must have been in a French-speaking African country as he is not old enough to be talking about WWII) ended with something like: “he eventually went native on us, drinking red wine and such.” I learn something new every day. I have been away from home for over a month and need a haircut. My barber for the last 35 years gets very upset if anyone else cuts my hair. During my two month stay in Baghdad in 2004 I was forced to get several and Mike complained for the next two months that it was taking that long to get it back into proper shape. Tuffs of hair now tickle my ears occasionally leading me to fear that a malaria-carrying mosquito has landed there. Our morning drive from Afex Camp to the Central Bank usually passes a lot of kids on their way to school. The girls and boys dressed in school uniforms is a lovely sight. There is little that is as encouraging and hopeful as seeing young kids smiling on their way to school, especially in a largely illiterate country. So there is hope. There is also little as heart breaking is the face of a child, usually a hungry child, with no hope. The expressionless, unfocused stare of such a child is more than I can bear. I think that we take hope in American (especially) so for granted that it is hard to imagine a people who have little of it. A great deal of our existence, especially our younger years are filled with the hope that we can build decent enjoyable lives for our selves and our loved ones. What would our youth have been without it? There seems to be a lot of hope in South Sudan now. I hope that it is justified and that it can be sustained. This entry was posted in Economics, Juba, Travel and tagged Africa, Amsterdam, Central Bank, Juba, South Sudan. Bookmark the permalink.